Many elements go into a successful community. Of course, a proactive environment for business is important, with jobs and incomes and profit and all those other good things, along with supplying the goods and services we need. But there are also many important aspects of community that come from the volunteer or non-profit sectors, where people donate their time and effort to worthwhile projects and enterprises work on the principle of serving rather than financially enriching their backers. The Community Wholeness Centre (CWC) is that kind of project. Founded by Yolanda Gallo and a team of volunteers late last year, CWC is still expanding under Yolanda’s executive directorship, where she is charged with mobilizing the community to embrace the CWC’s opportunities. Located in the heart of Barrie, CWC is a conference and business centre combining office space rentals and meeting facilities with a new grassroots model of self-sustainability for Barrie’s volunteer headquarters. If you are planning a trade show or need a facility, this location offers ideally-located space that can accommodate up to 350 people in various configurations using a gym, a large kitchen, boardrooms and meeting rooms. There is also private space available for short-term or long-term rental. To date, 9 community groups are calling CWC home. What makes this business model unique is that all of the rental fees are reinvested back into the community. Guided by a business advisory committee of local experts knowledgeable on entrepreneurialism, volunteerism, marketing, and growth, CWC has leveraged approximately $30,000 in donated materials, supplies and services from local supporters like Tile Master, Giant Carpet, Barrie Trim and Moulding, Sue Kay/Allandale Decorating, Hunter Electric, Kwik Kopy, Moore Packaging, Horizons, Simcoe North Visual Printing, Artistic Frameworks, Lloyd Management Services to name a few, as well as a similar amount of financial investments by key affiliates and up to 25,000 volunteer hours to renovate, decorate and run the day-to-day operations of CWC. From a facility rentals perspective, not-for-profit groups will find very reasonable rates for their facility needs. Businesses can co-locate their office in a supportive, holistic environment for their staff and clients. Do you already volunteer in the community, or would you like to? As a home to Barrie Volunteer Headquarters, CWC will serve as a clearinghouse for volunteers with an objective to support all not-for-profit organizations by providing volunteer intake, screening, obtaining police record checks, training, mentorship, networking, and free rewards. A benefit for volunteers is that they can treat themselves to free services like Spanish, music, martial arts or meditation classes offered by the CWC, to restore their energy so they can continue to serve. If this initiative sounds as wonderful to you as it does to me, there are several ways you can connect and show your support. Rent office or facility space for your business or events. Host or attend the scheduled trade shows. Register as a volunteer. Provide financial or in-kind support to help build a legacy for our whole community. I believe Barrie can be a more complete and resilient community if we focus on this kind of “paying it forward” initiative, don’t you? For more information email admin@cwcbarrie.com, telephone 705-733-5683 or visit www.wholenesscentrebarrie.com. Published as my Root Issues column in the Barrie Examiner as "Would you like to volunteer in our community?" If you want to hide a story from the public, release it late on a Friday afternoon, with no fanfare. 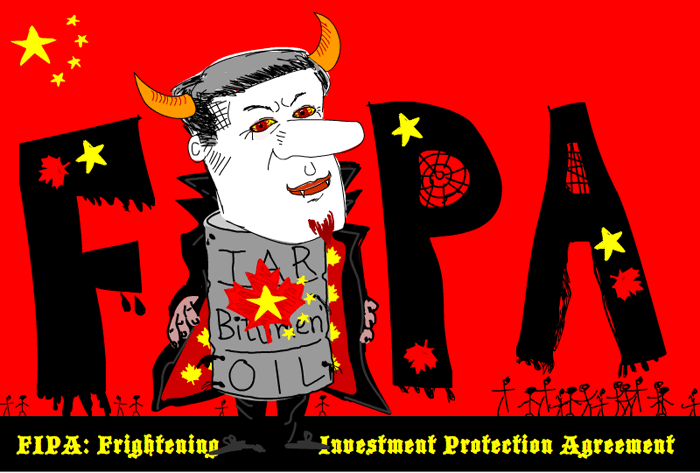 This past Friday, the government quietly announced they had ratified the FIPA trade pact with China. Negotiated secretly and signed by Prime Minister Harper in Vladivostok, Russia, 2 years ago, ratification had been delayed under protest from many sectors about its flaws. And what flaws they are! Essentially, this treaty allows Chinese companies, including state-owned enterprises, to sue Canada for any new law or regulation they feel threatens their profits. So laws to protect our environment, health, resources, jobs, culture, or values are now subject to Chinese approval! But in keeping with the secrecy under which this accord was negotiated and signed, those lawsuits will be secret until an award is issued by the unelected tribunal; if a settlement is reached, it might never be made public at all, even if it involves paying huge sums of our tax money to Chinese companies! And unlike NAFTA, which has similar (although much weaker) investor-state provisions but can be cancelled with only six months’ notice, this trade deal locks us in for at least 31 years. Yes, that means the next 7 governments, regardless of who we elect, are bound by it. At least we had a good debate on this first, right? Wrong. There were no public hearings or consultations, no vote in Parliament, and only a single hour of discussion in committee. If, as proponents argue, this deal is such an amazing advance for Canadian interests, why were all of us supposed beneficiaries kept in the dark? Government should be eager to trumpet good new trade initiatives. Outstanding court challenges should have prevented ratification, especially a rather solid one from the tiny Hupacasath First Nation. Caring greatly about our future, they have been on the forefront, trying to protect all of our constitutional rights. They know what it’s like to have your rights stolen away, and this deal will overrule not only indigenous rights but also those of our provinces, municipalities, and federal government. And even though their ruling has yet to be reviewed, the Harper government has gone ahead and ratified, also apparently not caring that this pact probably violates the Canadian constitution. Who benefits? The main winners look to be huge Chinese enterprises, including state-owned ones, looking to buy up more of our resources and expand tar sands extraction, for example. This deal seems like nothing more than a sacrifice of most of our values for the sake of some big investment money to dig up more dirty bitumen to ship to China, at the cost of our air, water, and forests. Can we stop being locked into this horrible deal? We’re told we live in a democracy, so let’s try. Greens, NDP, and to an extent Liberal MPs have gone on the record against this, even some Conservative supporters and Cabinet members have expressed reservations, so we’re not starting from square one. Sign this or similar petitions hosted by other groups. Write letters to the editor to show your outrage. Contact your MP and demand your concerns be raised in the House. Make your voice heard, or for the next 31 years hold your peace! Published as my Root Issues column in the Barrie Examiner as "China deal all but hidden from public"
Things are heating up on the global warming front. In New York City on September 21st, hundreds of thousands of people from across the US and around the world will gather together to make an un-ignorable demand that world leaders at the following UN Climate Summit act faster and more decisively to reverse the growth in greenhouse gas emissions. Meanwhile, I have a friend walking across America as part of the Great March for Climate Action, and I’ve been invited to give more Climate Reality presentations in my local community. Of course, there are entrenched interests who want to expand our self-defeating fossil-driven economy for their own selfish gain, so naturally they are beating the drum of climate denial. Last week Lorne Gunter trumpeted a study by an economist in a pay-to-publish Chinese journal which supposedly refutes global warming, showing the past couple of decades have had a relatively stable temperature. Now, stable is hardly the word I would use to describe the weather weirdness we’ve seen over the past decade, but I guess economists see things differently. But it’s a weak argument. There is no denying our climate has warmed significantly over the past century, as our growing population’s land and energy use have altered the chemistry of our atmosphere. 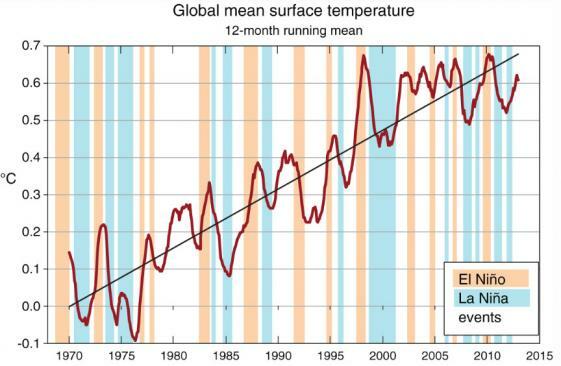 The past 354 months, without exception, have all been warmer than the 20th century average. That means that anyone born since February 1985 has never, in their whole entire life, ever experienced a month that was at or below global average temperatures. Pick two points at the same height and call it a "pause". Who cares about the bigger trend? This supposed “pause” only appears when you cherry-pick your end points and focus solely on surface temperatures that under-sample arctic regions, and totally ignore the actions of the world’s oceans, a major heat sink. It’s expected for climate change to come in fits and starts, rather than as a steady one-way trend, just as a road ascending a mountain has level or even short downward stretches. The key is to look at the wide range of indicators – temperatures at the surface, in the high atmosphere, and in the oceans are a start, but shifts in weather patterns (like floods and drought) are also important, as are the responses of natural species. When you put those together, the picture is quite clear – we are rapidly changing our climate in unpredictable ways by adding more heat-trapping gases to our atmosphere. It’s ironic that even climate deniers must admit the climate is warming to give the term “pause” any meaning. This whole politicization of climate change is unique to English-speaking nations; in the rest of the world, the debate between left and right isn’t whether our pollution is changing the climate, but how best to address it. Even here, at the municipal level and among building and infrastructure professions, climate change is a given. Now is the time for the conversation on climate to shift from debate and despair to determination and solutions. Accept no more fuddle-duddle from our national leaders! This Tuesday, September 16th, you can tune in to “24 Hours of Reality: 24 Reasons for Hope” at www.24HoursofReality.org and learn what is happening to our climate, and the many existing tools we can activate, either individually, as communities, or as a nation. We have the technology, let’s build the will and the movement to use it! Published as my Root Issues column in the Barrie Examiner as "Reversing the growth in greenhouse gas emissions"
What if you went to a public beach, were careful to pick up and take away any trash you created, but the people next to you left a pile of garbage? And what if their excuse was “well, we pay parking fees and taxes that go toward cleaning the beach, so it’s our right to litter”. Would you accept that, or should they get fined? I know how I feel, and I hope you feel the same: people must be responsible for the cost of cleaning up their own mess. It’s not fair to make us pay, through taxes or other burdens, for the garbage of others. That includes the trash from making and packaging the consumer products we buy. Yet right now, much of the cost of taking your garbage away from the curb is paid out of general property tax, regardless of how much actual trash you do, or don’t, toss. The same goes for recycling. That means those who make the most waste are subsidized by the taxes of those who make the least. Yet this can easily be fixed, and if Ontario’s Waste Reduction Act is re-introduced and passed, we’ll be well on the way to having waste pay for itself. Franke James was Banned on the Hill for saying this! This legislation would replace the much-maligned and ineffective industry-managed “eco fees” we’ve had to pay for several years. It makes good sense for consumers to pre-pay the cost of disposal of the products they buy, and the related packaging. But under the current system, a standard fee applies, with no regard to how much or little waste the particular manufacturer creates, which means no incentive to choose greener producers. So if ACME is wasteful but Zenith is green, you pay the same eco-fee for a TV from either. Under the new system, ACME will pay for their own wasteful ways while Zenith will save, passing that on to you in the price. Affordable Zenith TVs will fly off the shelves while overpriced ACME ones get dusty. All producers who reduce waste or packaging will have more sales and profit while wasteful ones will dwindle. Sadly, this Act didn’t pass before the recent provincial election. But on our behalf and at the suggestion of Canadians for Clean Prosperity, last week Barrie’s City Council passed a resolution for the government to re-introduce it. Contact your MPP and add your personal voice to this request. When polluters get out of paying for their harms, the costs fall on the rest of us, in the form of higher taxes and other financial burdens. Changing the rules to harness the power of competition to make our economy greener will lower our taxes, reduce waste, and spur innovation leading to high-quality jobs right here at home. No more subsidizing pollution and job stagnation! 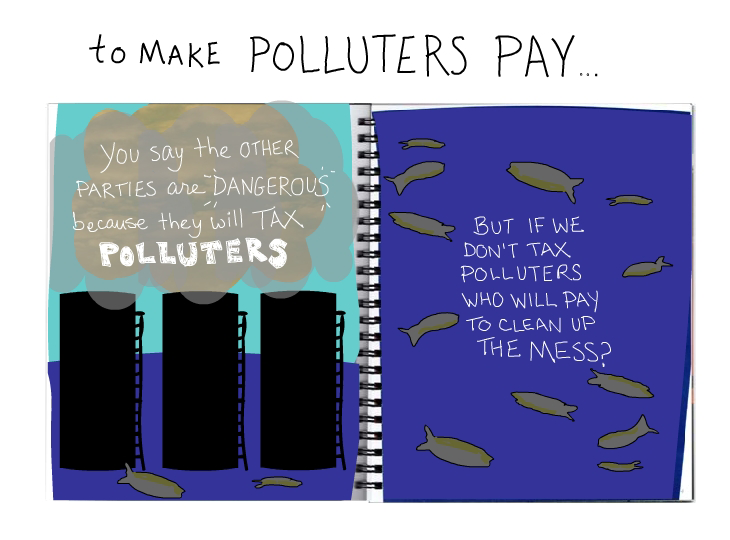 Make polluters pay, so they compete to pollute less! Oh, and a special nod goes out to Pizzaville Barrie South, who took up my challenge last week and will now be donating pizza for blood donors on Tuesday & Thursday afternoons, joining Toppers who donates Thursday lunch. Hurray for our bloody generous local Barrie businesses!